Abdelazer (also Abdelazar) or The Moor's Revenge is the name of a play written in 1676 by Aphra Behn. The work was itself an adaptation of a previous work called Lust Dominion, possibly authored by Thomas Dekker. 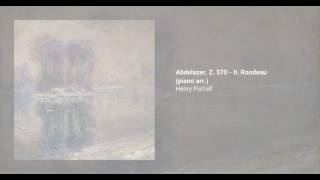 Henry Purcel wrote incidental music for a 1695 performance of Abdelazer, with the second movement (a minor-key rondeau) becoming quite popular, and the subject of numerous adaptations.